Info "Turn the handle and raise the flag! That's all you gotta do!" Wario Windsock is a microgame found in the Anything Goes folder in WarioWare, Inc.: Mega Microgame$! and WarioWare, Inc.: Mega Party Game$! 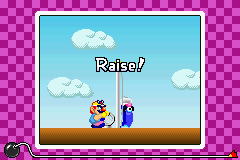 The objective of the game is to have Wario raise the flag to the top of the flagpole. 1st level difficulty: The player must rotate the D-Pad/Control Stick 5 times to raise a blue flag. 2nd level difficulty: The player must rotate the D-Pad/Control Stick 7 times to raise an orange flag. 3rd level difficulty: The player must rotate the D-Pad/Control Stick 10 times to raise a grey flag. This page was last edited on December 5, 2018, at 18:17.